Today is going to be the first day of a week long contest here at Secrets of the Spiral. If you would like to enter, here is what you have to do. 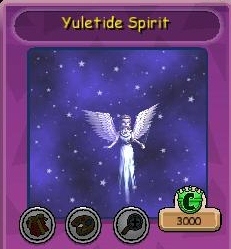 You know the "packs" Wizard101 offers in the crowns shop (Wyvern's Hoard, Nightmare, etc.)? Well to enter this contest, I would like you to make your own "Holiday Pack". Create your own holiday-themed pets, mounts, housing items, pet snacks, plants, gear, etc. Be as detailed and creative as you can. 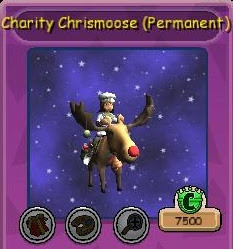 First place will win a new Charity Chrismoose Mount. Second place will win a Yuletide Spirit Pet. 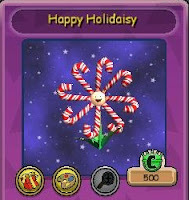 Third place will win a Happy Holidaisy seed. Email your entry to this email address: secretsofthespiral@hotmail.com by 5:00pm EST on Monday, December 19, 2011. The email subject line should say "Holiday Pack Contest"
Please include your wizard's name, but no other personal information in your email. Your entry must include at least 7 items, but if you would like to include more, you may. Include as much detail as possible. If you would like to include picture files, that is okay, but it is not required. All entries must be family friendly, with no inappropriate ideas or language. Cool contest, and nice blog you have here. If you're interested, I'm at swordroll.com! Meanwhile, I'll be thinking of an idea of a new pack! Autumn is it okay if two people worked together on a pack, for example if they won first prize could they get like two candycane mounts instead of one chrismoose? Sure, just put both names in the email please.